The Limousine Scene | Luxury Transportation At its Best! As the month of March quickly approaches, I can’t help but already start to plan one of the most fun days of the year, St. Patrick’s Day! My favorite color is green so this day makes me go crazy, in a good way, of course! I decorate my desk at work and wear green clothes and accessories. Every year I go to the most Irish (themed) bars in town and take full advantage of the green beer each bar provides for the day. I enjoy bar hopping to check out how each bar has decorated their venue and to see what the crowd is wearing. As much as I like bar hopping, paying and tracking down a cab that night is soooo difficult! With St. Patty’s Day being on a Saturday this year, it is going to be that much more difficult to bar hop. And of course you don’t want to drive. You want to be able to enjoy the night and throw a few back. A DUI is not worth it. This year, Limousine Scene is offering a GREENTASTIC St. Patrick’s Day Deal! Not only can you get the party started by drinking in the limo on the way to your first bar but you can arrive and depart in style. You won’t have to worry about calling a cab company and waiting forever for dispatcher to answer, sitting on the side of the curb waiting for your cab to show up or deal with stinky cabs and well, drivers too. 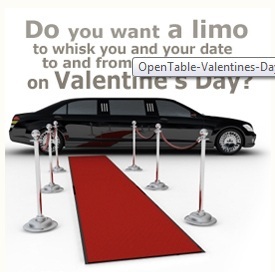 Picking up your date in a limousine to go anywhere screams romance! Valentine’s Day is just around the corner. While it is a perfect time to charter a limousine for a night out, any night out in a limousine is enhanced by the ambience of class, style and luxury. The moment the limo arrives, the pampering begins as your chauffeur holds the door open for your grand entrance into the lap of luxury. You’ll find a bottle of champagne chilling on ice and beckoning to be uncorked and poured into the fine crystal champagne flutes. You’ll also find soft drinks and bottled water. If you need a little extra kick, there are crystal alcohol decanters ready for your indulgence. The destination of your limousine is your choice. The route is your choice. Your chauffeur is there to tend to your needs during the night and make the night as perfect as possible. If you don’t want to do all the planning yourself, we can take care of an exceptional Valentine’s evening for you. For $165, we will set up dinner for you and your Valentine at RJ’s Bar and Grill. The price includes your choice of several entrees including prime rib, shrimp scampi, jumbo bacon wrapped prawns or rosemary chicken. You also get soup or salad, a dessert to share and complimentary non-alcoholic beverages. That price includes a gratuity for your chauffeur and your server so when we say it is an “all inclusive package” we mean that absolutely everything is covered for in the $165.00 price. 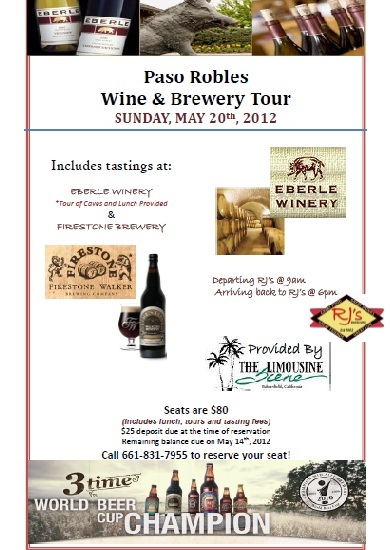 We can only take a limited amount of reservations and RJ’s has a limited number of tables for this special night. Make it memorable and one your Valentine will never forget by calling us today at 831-7955 to place your reservation while space is still available. I would like to ask for your very important consideration. 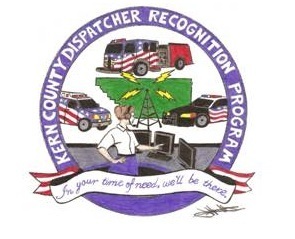 On April 13th, Limousine Scene will once again co-sponsor the Kern County “911” Dispatcher Recognition Program. The recognition dinner program will be held at Crystal Palace and recognizes the people who answer our calls to 911 in the worst time of need. This includes police, fire and sheriff agencies as well as the local CHP dispatchers. I am pleading for your help. We cannot do this without community support and the dispatchers who work behind the scenes deserve to be recognized. 911 dispatchers are the first person you talk in an emergency. They provide lifesaving instructions before help arrives. They answer the call of a police officer shouting into his radio, “Officer Needs Assistance” and thousands of medical emergencies each year. They’re there on holidays, nights and weekends. They deliver babies and save lives through medical instructions given by phone. They are unsung heroes worthy of community recognition but there are no public funds for this. I am asking you to help us through your generous donations of monetary donations, goods or gift certificates to be used as awards. Please adopt a table of dispatchers for $250. Even $25 will help. Any and all contributions are appreciated and gladly accepted. Checks should be made payable to KCDRP and mailed to us at 317 Ming Avenue, Bakersfield 93307. All contributions will be recognized in a keepsake program, table signs and digital logos provided by you to be shown on the big screen of Crystal Palace for your support of our local heroes. Dispatchers ride a roller coaster of emotions dealing with human tragedy on a daily basis. Please help us reward their effort and service to our community. Please don’t put this off. Take a moment right now if you can and participate with us today.